The race for Illinois governor – the second-most expensive gubernatorial election in U.S. history – will be determined in just a few days and both billionaire candidates – Republican Gov. Bruce Rauner and Democratic challenger J.B. Pritzker – are making their final appeals to voters. Pritzker, who’s spent more than $100 million on his campaign, is leading Rauner in the polls, but drew criticism earlier this week for suspending – and eventually firing – two campaign staffers after a photo of one wearing a “charcoal face mask” was posted on social media. Rauner, who released a digital ad this week touting his humble Deerfield upbringing, did not meet with President Donald Trump or receive any public shout-outs during Trump’s visit to southern Illinois on Oct. 27. According to Chicago Sun-Times political reporter Tina Sfondeles, that perceived snub might actually help Rauner in a state where Hillary Clinton beat Trump by a margin of more than 15 percent in the 2016 presidential election. 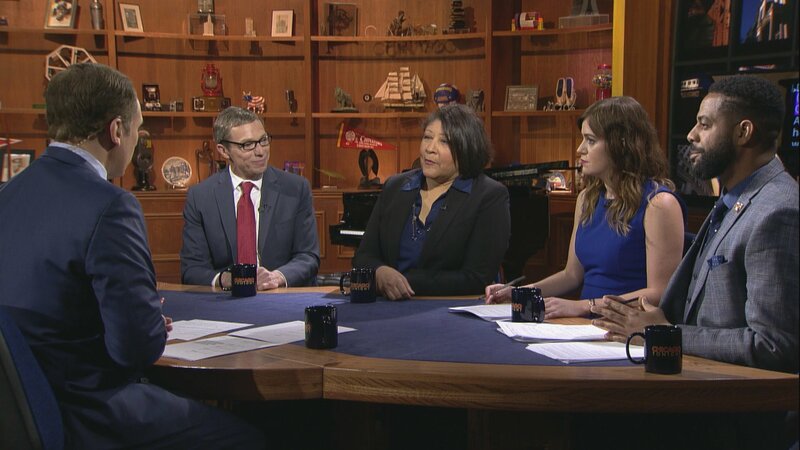 More on the Governor’s Race: Watch our two-part documentary special, “The Race for Illinois Governor 2018,” featuring an in-depth look at J.B. Pritzker and Bruce Rauner. Health concerns in Chicago were stoked after a report revealed that nearly 20 percent of Chicago homes with water meters tested by the city had dangerous levels of lead, a highly toxic metal that can cause permanent brain damage. In sports, the Chicago Bears hope to stay on top of the crowded NFC North division ahead of a matchup with the Buffalo Bills this Sunday. And native Chicagoan Jabari Parker of the Bulls makes his home court debut at United Center. The conversation continues in our web-extra video. This week, Arruza and guests discuss Kanye West’s donation of $126,460 to Chicago mayoral candidate Amara Enyia, bringing his total contributions to the community activist to $200,000. The contribution followed a tweet by the Grammy Award-winning artist in which he says he’s “distancing [himself] from politics and completely focusing on being creative !! !”.